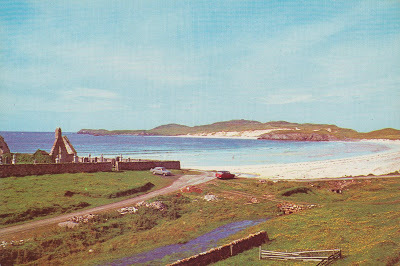 The above is a postcard from around the 1960s. 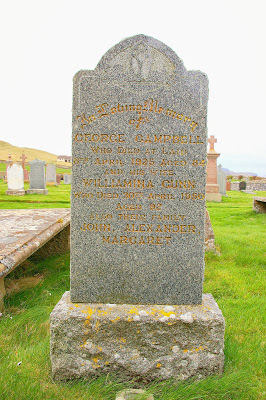 The Balnakeil Old Cemetery at Durness holds Gunn graves and also the grave of the Gaelic poet Rob Dunn (and other people are buried there, of course). 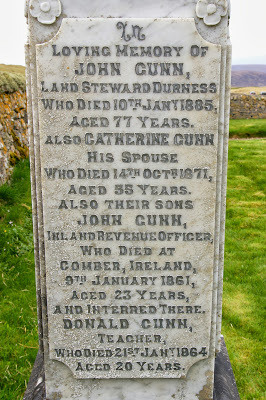 It certainly holds the grave of John Gunn, Land Steward of Durness and his family. He descends from the Mackeamish / MacHamish line. My own records have many of his descendants alive in the 1970s. The key point is that his family is well known; it's just another reminder that there are many who can readily show descent from 'Gunn Chiefs'. The memorial to John Gunn, Land Steward, Durness, his wife Catherine Gunn and other members of his family. His daughter Williamina Gunn b. 1859 - d. 1950, married George Campbell b.c. 1860 - d. 1925 and with children John, Alexander and Margaret. Page 173, Neil M. Gunn Highland Pack, Faber and Faber 1949.